With an array of new pop bands flooding TV screens every day, it is becoming more difficult for the newbies to stand out in the music scene. Aspiring idols, thus, are turning to acting to swiftly gain popularity from the public and broaden their presence in showbiz. Now it is common to see idol stars in the Monday-Tuesday and Wednesday-Thursday dramas on major TV networks. Among them are two girls -- Krystal of K-pop quintet f(x) and Sooyoung of megahit girl group Girls’ Generation -- who are vying to win the hearts of viewers in the dramas being aired in the same time slot. Krystal plays the female lead in the Wednesday-Thursday SBS drama “My Lovely Girl” costarring with global star Rain. 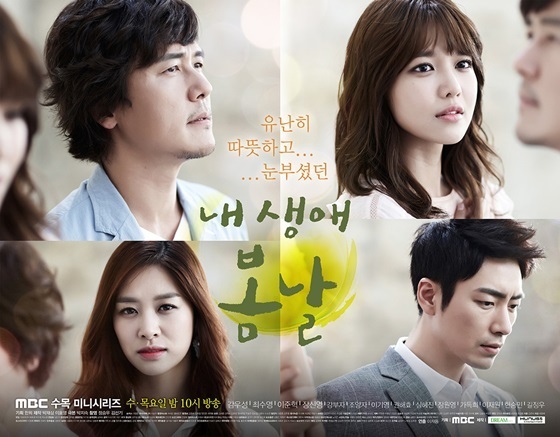 Sooyoung, meanwhile, plays the heroine in the rival MBC drama “The Spring Days of My Life” with veteran actors Kam Woo-sung and Lee Joon-hyuk. Some idols play a small part. Secret’s Hyosung and ZE:A’s Park Hyung-sik star in the daily drama “My Dear Cat” and weekend drama “What’s with This Family,” respectively. According to local newspaper Seoul Daily, idols starred in 32 dramas, or 45.1 percent, of 71 dramas that aired on three major broadcasters and cable channels this year. There are two reasons why drama producers increasingly seek idols for their shows: idols’ fame and influence. “There are not many 20-something celebrities who retain popularity and star power that can promote recognition of dramas,” Ham Young-hoon from KBS drama department was quoted as saying. Another official from SBS also agrees with Ham. “We lack actors and actress in their 20s in the drama scene as most of those with fame and popularity move to the film industry. When we fail to cast one of a few popular 20-something stars, we turn our eyes to idols,” he was quoted as saying. In fact, marketing TV series becomes easier when using idols’ clout and popularity. Many of the stars have solidified their fandom abroad by closely communicating with fans through social media networks such as Weibo and Twitter. That means when the idol-featuring dramas are aired, they can have a wider appeal to viewers all over the world. Above all, acting is what really matters. In the past, many of the idols-turned-actors and actress were criticized for their unskillful acting, but nowadays most of them gain high acclaim for their professional performance. But concern remains. “Idol-turned-actors and actresses have a strong image as lovely, cool idols for teenagers. Some idols have difficulties shedding the image and playing the characters in dramas,” a culture critic pointed out.